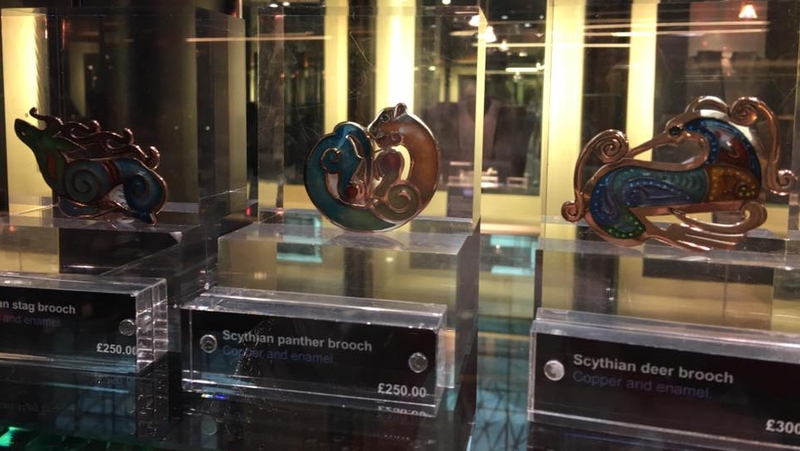 I Have Pieces in the British Museum! 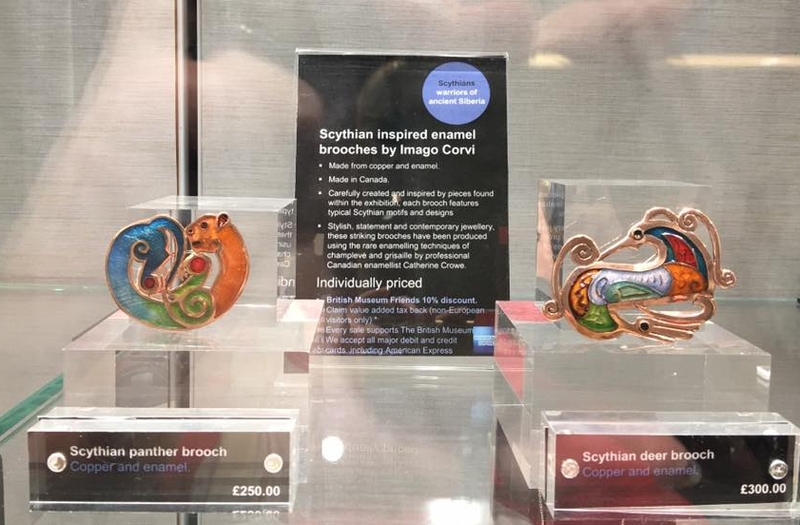 I was delighted earlier this year to be approached by the British Museum to make some pieces to go with their “Scythians: Warriors of Ancient Siberia” exhibitions. They are not, of course, actually in the museum! Just in the museum shop – still, I was excited! I have always used ancient artifacts to ispire my work, so it was nice to know they were going to be seen in this context. 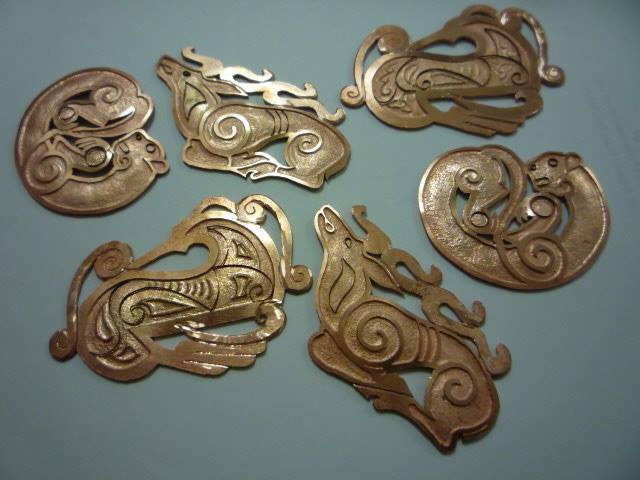 They chose champleve pieces that I had actually designed some time ago when I became enamoured of the Scythians myself. 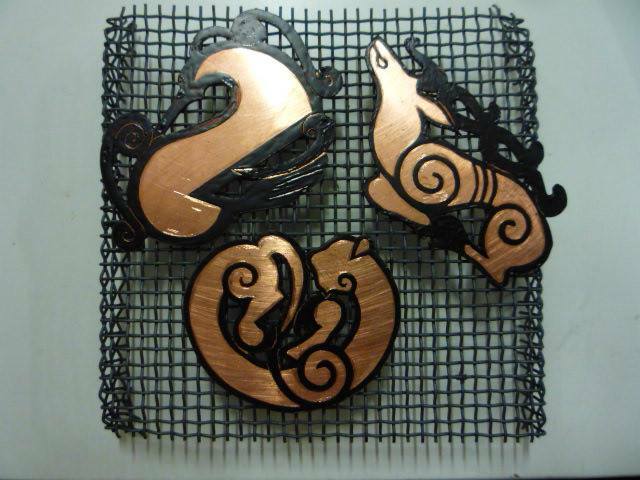 Their animal art is often reminiscent of Celtic art, and there is some speculation that the two peoples did meet at some time. They were a loose confederation of tribes from the Steppes of Russia that spoke a Persian language. They are mentioned by Herodotus and also in the annals of early Persian monarchs. This is the after etch stage, with internal cloisonne wires already added. But the best part was when a Facebook friend went to England, visited the exhibition and took these great pics of the pieces as they were displayed in the shop. I don’t think I have ever seen my work so well displayed. It was a great pleasure! Ah ha, I thought that was your work! I was booking tickets to the exhibition and saw your pieces. They are so distinctive and beautifully made they were instantly recognisable! 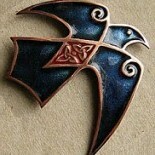 I fully intend to look at them as a bonus mini enamelling exhibition when I go, which is really exciting!! Thanks so much for your kind words! I wish I could come myself! This entry was posted on September 26, 2017 by imagocorvi in champleve, commission, enameling, exhibition, history, inspiration and tagged British Museum, champleve, commission, enameling, fine craft, Scythian, work.